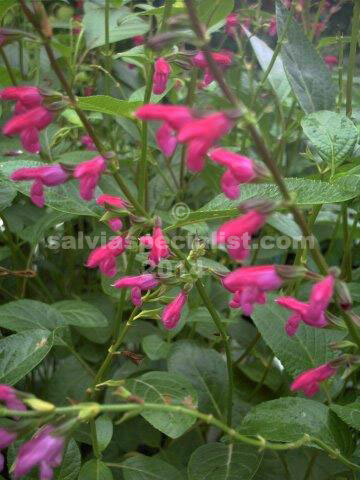 This useful plant originates in Chiapo, a southern state of Mexico. One of the first of my introductions. It is a bit frost tender but will grow and flower well under the protection of evergreen trees. Once established it will cope with the dryness often found under trees. Chiapensis is not easy to kill but neither does it become a nuisance. It has very attractive shiny olive green willowy foliage and magenta flowers year round even in quite heavy shade. Clumping growth to about 60cm makes it suitable also for pots. The thickest old stems could be cut to the base once a year or so. Cuttings can be grown or it generally sets seed. Heat and humidity might cause a fungous marking in summer in tropical areas.